ST. GEORGE – No matter the time or place, volunteers with the Washington County Sheriff’s Search and Rescue team and other responders answer the call to look for and help the missing, the lost and the injured. These vital operations often give rise to questions from the public about how they are funded and paid for. The search and rescue team comprises 60 volunteers who work with a mix of their own personal equipment and items and materials supplied through the Sheriff’s Office. Sometimes a medical helicopter such as Intermountain Healthcare’s Life Flight or an ambulance service is called in to aid in a search or respond to a medical situation. There are public and private sources of funding and rules laid down on how that money is to be used. However, make no mistake, the cost of a search and rescue mission is far from the minds of volunteers and others when called out to look for someone, be they missing, lost or injured. “I never consider how much it’s going to cost. I don’t care,” said Washington County Sheriff’s Deputy Darrell Cashin, who acts as the liaison between the Sheriff’s Office and the county’s search and rescue team. “We’re trying to save a human life here and I don’t consider the cost of that,” he said. Last weekend alone, the county’s team, sometimes referred to as WCSAR, responded to four calls for help in the area. 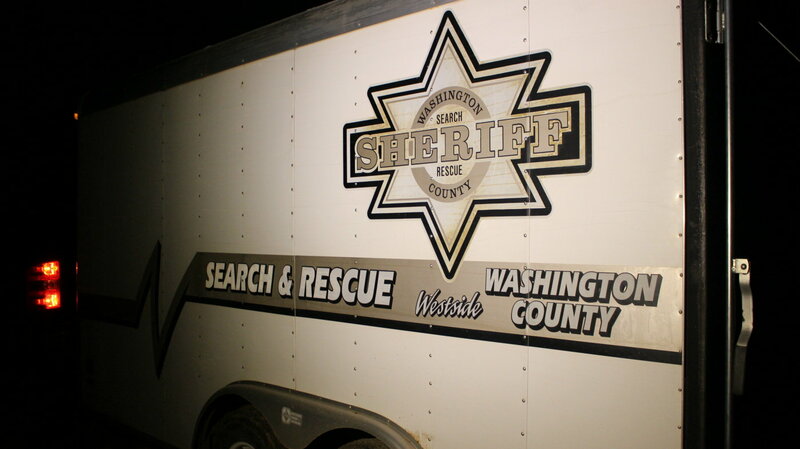 A few nights before that, there was another WCSAR operation in which Cashin put a call out for retrieval of a man who had crashed his dirt bike on the south side of Pine Valley Mountain. 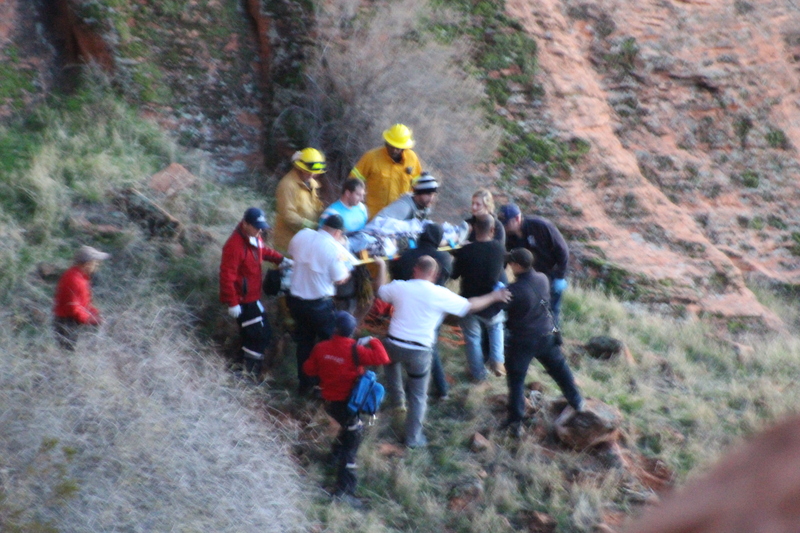 The man had hit a rock and ended up flipping over the handlebar and likely injured his back after hitting the ground. A friend he was riding with called 911 and WCSAR was dispatched accordingly. 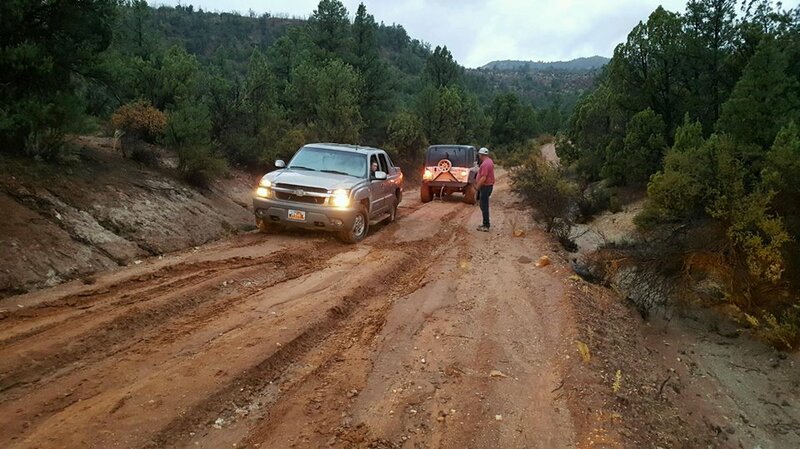 Volunteers who responded to the scene came in four-wheel drive jeeps and on ATVs as the Forest Service road leading to the man’s location was rugged, rocky and none too hospitable to regular vehicles. Once the man was examined by a medic with the WCSAR team, it was determined he would need to be flown out by a helicopter as there was too much of a risk involved in driving him out. Being jostled about while strapped to the backboard bolted to an ATV wasn’t seen as a friendly option to the injured man’s back. So Cashin contacted Intermountain Life Flight’s helicopter crew and they soon arrived to take the man to Dixie Regional Medical Center in St. George. Money used to purchase general equipment, repairs and supplies used by the Washington County Search and Rescue teams comes from public funds taken from a part of the fees paid toward registration and renewal of off-road vehicles and boats, as well as fishing and hunting licenses. In the case of the Pine Valley Mountain rescue, for example, those funds might have paid for the purchase of one of the ATVs used to reach the injured man, to fill the gas tanks of volunteers’ personal vehicles used during the operation and other such expenses. “(The public money) goes to cover equipment costs and to cover equipment purchases, repairs, supplies for searches – any incidentals concerning search and rescue,” Cashin said. At the end of every WCSAR mission, Cashin is required to fill out paperwork that tracks the associated cost of the operation. This includes estimated volunteer hours, vehicle mileage, the cost for equipment involved and so forth. Additional forms are also required to track the cost of training exercises and equipment purchases. The forms are subsequently reviewed by state officials who then reimburse money to county SAR teams through the Utah Sheriff’s Association. According to a 2015 state reimbursement report, Washington County received reimbursements amounting to $10,054 for callouts, $10,189 for training and $3,143 for equipment. Also according to the report, Washington County had the second most search and rescue missions in 2015 at 111. Grand County took the top spot with 125 missions. Overall, there were 604 missions conducted throughout the state that year. While 2016 appeared to slow in relation to callouts, this year may yet rival 2015’s numbers. From the end of February though early April, calls for help have kept the WCSAR teams particularly busy, Cashin said. In 2013, the budget allotted to Washington County Search and Rescue through the Sheriff’s Office budget was $20,000, Cashin said. The search and rescue team received $37,000 in the latest budget. The public funds are used to cover costs as much as possible, yet it sometimes isn’t enough. This is where private funds garnered through donations and fundraising comes in. “A lot of people are pleased and feel extremely blessed when Search and Rescue finds a lost loved one,” Washington County Commissioner Dean Cox said. One of the ways people have shown their appreciation is by donating money to the WCSAR team. Civic groups and businesses also tend to hold fundraisers for the team, both Cashin and Cox said. 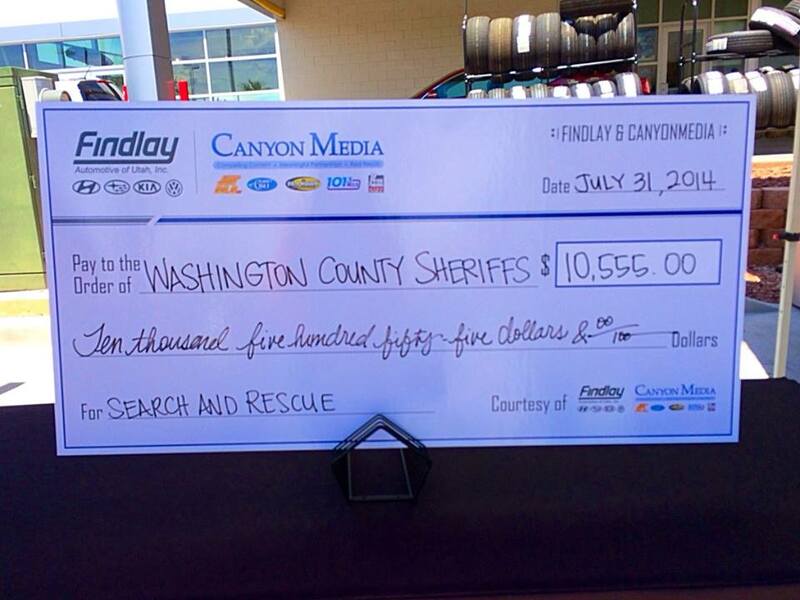 In 2014, Findlay Subaru donated over $10,000 to the Washington County Search and Rescue team. Other groups, like the Rotary Club, also made sizable donations to the search and rescue team, Cox said. “They’ve made substantial contributions,” he said. Private funds are placed in an account separate from the public funds. Use of the funds is voted upon by the leaders of the WCSAR team who are elected by the volunteers. When they feel they need a new piece of equipment they approach the board overseeing the fund. If approved, the purchase request is given to Cashin who takes it from there. “The funding these groups do is what really sustains us and allows us to get some of the equipment either replaced or get new equipment we need,” Cashin said. What of Life Flight, though? Who pays for that? Well, if the helicopter is called out to help aid in a search or to pick up formerly missing individuals, there is no cost. “That’s part of our gift to the community,” said Terri Draper, Intermountain Healthcare’s southwest region communications director for Dixie Regional Medical Center. Aiding in search and rescue operations at no cost is also a part of an agreement Life Flight has with the Utah Bureau of Emergency Medical Services, Draper said. Cashin said he only requests Life Flight’s participation in a search operation under certain circumstances. When possible, he often expresses to media his gratitude for Life Flight’s help when recounting an operation they participated in. 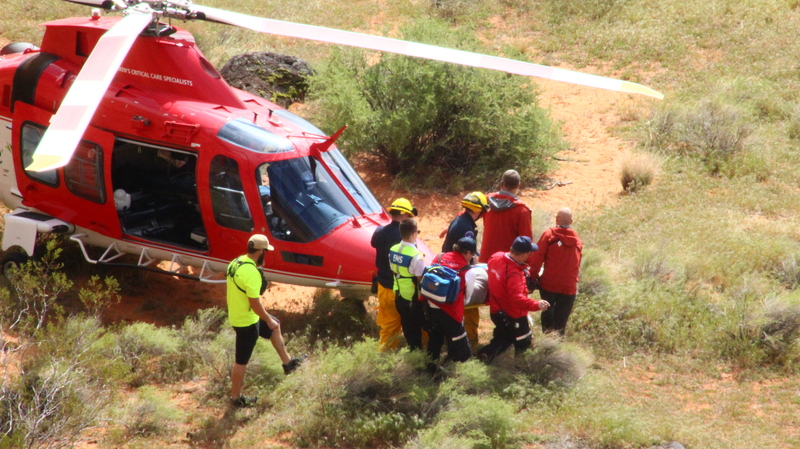 However, as in cases of medical transport – like the man who was injured in the Pine Valley Mountain bike crash – Life Flight will apply charges. According to the National Association of Insurance Commissioners, or NAIC, an average cost for one air ambulance flight can be between $12,000 and $25,000. Insurance reimbursements for air ambulance services will vary depending upon patients’ policies. Similar factors also apply to ground-based ambulance services that respond to search and rescue calls. It is quite rare that a county search and rescue team will seek payment from the people they’ve helped for those services. However, it once happened in Washington County, Cox recalled, while he was a member of the search and rescue team. A man they were searching for had evidently faked his death, Cox said. Once the man was located and the truth was learned, the county determined what he owed and he ultimately paid it. 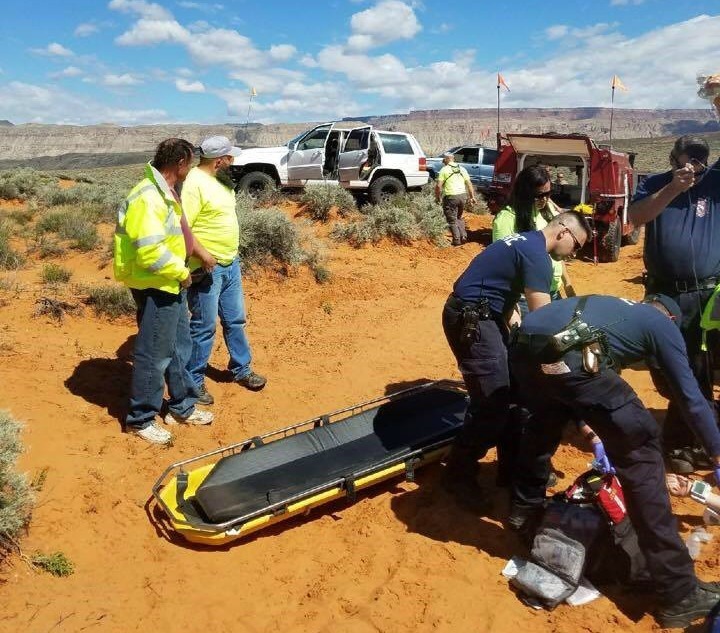 Recently the Utah Legislature passed laws pertaining to a Utah Search and Rescue Assistance Card Program administered through the state’s Division of Emergency Management. Individuals, families and qualifying organized groups can participate by buying an assistance card. According to the law, counties cannot seek reimbursement from a cardholder. Implementation of fees and enrollment procedures are pending with regard to the new legislation. All that aside, Cashin said he isn’t too worried about funding for the search and rescue team running out due to spikes in callouts. Sometimes the team can go 30 days without a call, he said, which helps spread out the costs. He also has the support of the county sheriff when needed. This is a group of volunteers who selflessly give of their time. I hope the community recognizes the sacrifice they give of their time and ability. Thanks to Mori and SG News for publicating this information! I’m sure that I’m not the only one who has wondered about funding, every time I see where SAR has been needed! And a special thanks to the angels of mercy who give up their time, and often their own money, to answer these calls for help! Just donate to the fund, you’ll feel better about yourself. Pay your tithing to SARS. I’ve thought about this idea of requiring insurance on those who engage in risky off-road ventures for many years and, while I agree with some kind of registration, heaping the blame on OTVs alone is not a reasonable answer. Trying to package insurance legislation that will cover every aspect of adventure-thrill seeking is tantamount to guaranteed failure in a state legislature. And, sadly, the solution will likely require greater intrusion of governments on any level. We are already burdened with excessive federal interference and Utah is quite sensitive to this, thus the idea sounds good, looks good but is not good. Yep, I’ve had a few 4 wheel atvs over the years and the only place I’d have ever needed something like tracks is thru snow, and in that case you should be using a dedicated snow machine anyways. A tracks set takes and adds a whole slew of new components to fail when out on a trail. I’m gonna say this was probably just a toy that someone thought would be “cool to play with” unless someone thinks they know better?. Then again, if u can actually put it to use for a snow rescue or something I guess it’s worlds cheaper than buying and maintaining a snowcat. Sounds like Search & Rescue is working just fine as is. Sheriffs Dept budgets for things and Volunteers do the rest. If we want to consider billing people then we must look at billing homeowners when Fire Dept finishes putting out fire. Or, bill someone when they call Police Dept to help them. Ambulance Service bills to help people because it’s a business. However, if it was a City or County owned maybe it could be free to residents or at least a reduced rate. Great story St. George News. So glad to see you informing the public about how important and valuable our search and rescue is to our community. If anyone is looking to donate money to a good cause, this is the one. You never know when you may need them. These guys do so much work for our community, on their own time, so let’s all donate so that they can continue to get the training and the equipment they need to continue to save lives. Besides it’s a tax deductible. I would rather see our search and rescue guys get my money instead of the federal government. Let’s keep the money here where it belongs.